We proposed an environmentally conscious architectural design for a start-up in Mission Bay, San Francisco, that has minimal environmental impact for operating and construction costs as well as that is future-proofed for changing energy demands. It is relatively easy to implement passive design strategies in mild climates like San Francisco, so the challenge was to design for comfort and to balance building performance with financial viability to reinforce our idea of true sustainability that encourages a continued effort to reduce impact on the environment. 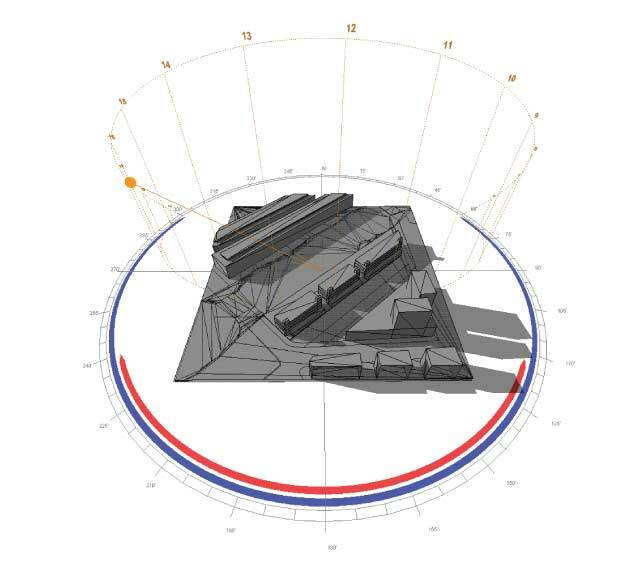 We performed daylighting and glare simulations using Radiance [DIVA] and sun path/ shadow analysis using Autodesk's Ecotect. 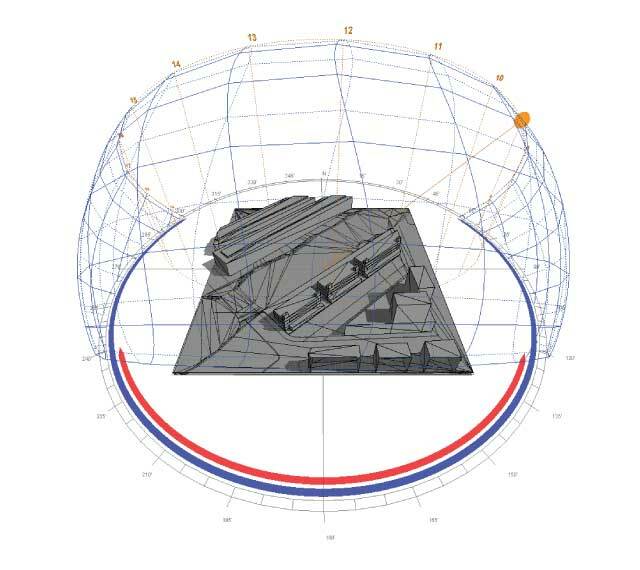 In addition, Design Builder and Climate Consultant softwares were used for energy simulation and to analyze climatic conditions of the site. 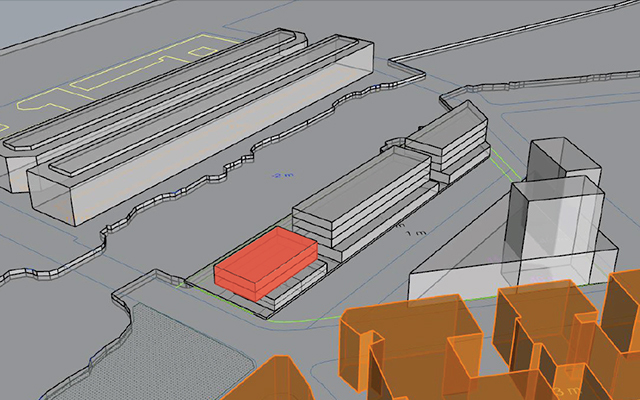 Our design optimized the orientation of the building and window-to-wall ratio to balance daylighting and natural ventilation to improve energy efficiency and thermal comfort. Our considerations for the future not only encompass the changing demand for internal loads, such as servers moving off-site, versatile open floor plan for future program and occupant need changes, but also the changing microclimate due to the rapid development surrounding the site. In the next few years, the site will be surrounded by other start-up offices, residential towers, and a park. 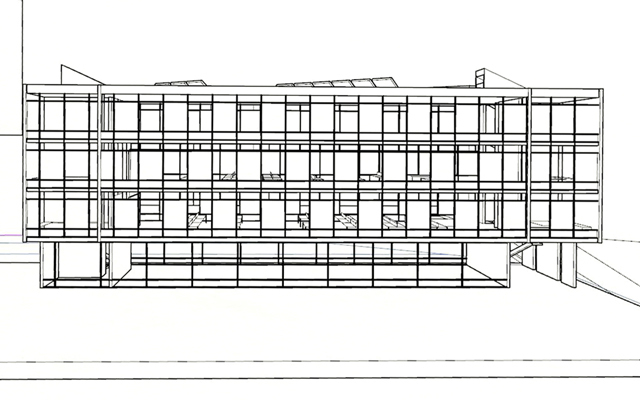 Our building houses office program above retail and café on the ground level. We focused our shading study on the "worst" month in June, when they get the most amount of sun. The site receives consistent solar gain throughout the year despite cold winter. 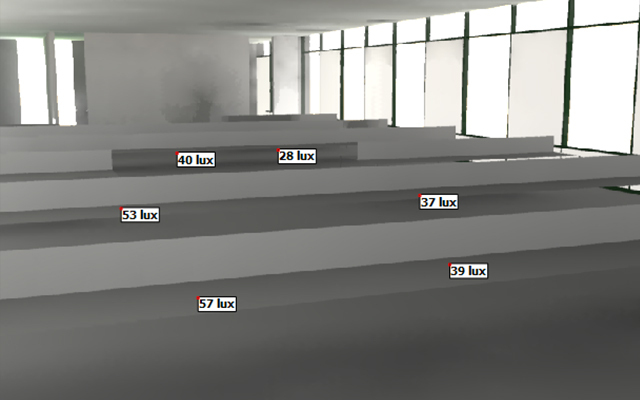 Daylight autonomy [DA] analysis shows that 74% of the floor area receives at least 300 lux 50% of the time the space is occupied. 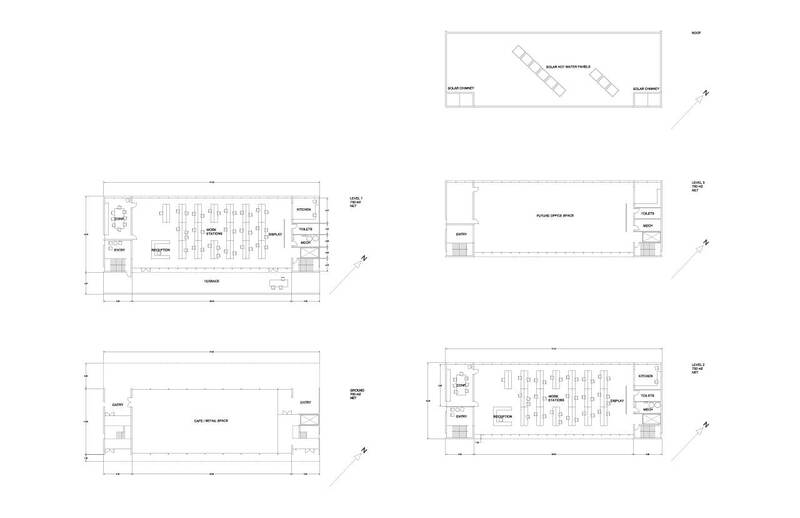 (300 lux is the recommended daylighting level for office space.) Shown below is the floor plan with DA values, ranging from 0% [blue] for storage room and spaces behind columns to 96% [yellow] near the windows. This shows that the glare is a concern near the windows. 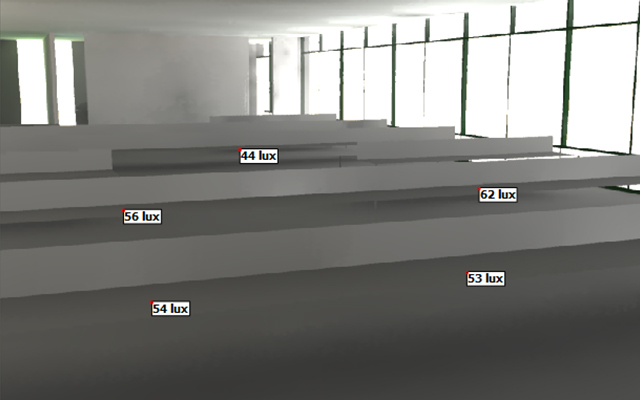 Illuminance studies (how much light falls onto the surface) to study daylighting and glare. During the daytime there is enough daylight in the space, but it should be supplemented with electric lighting in the late afternoon. In our simulation we customized material properties for the building materials and furniture with RGB colors, specularity, and roughness. 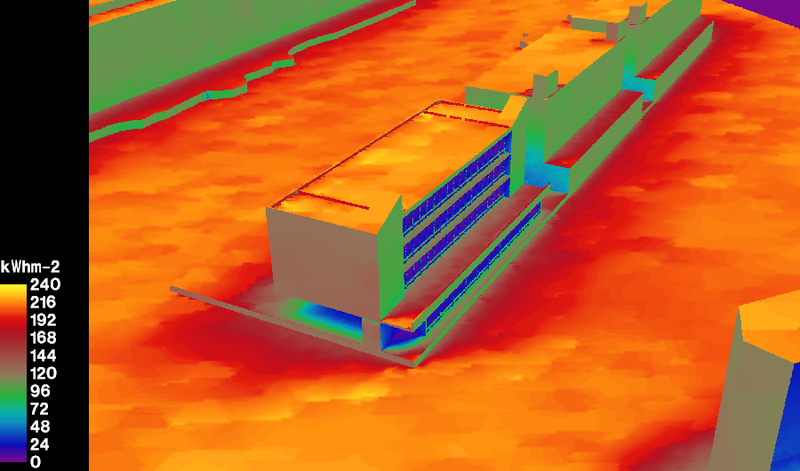 Based on the solar radiation on the roof (shown below for July 1 - 30), seven solar collectors can provide hot water for the entire building with 100 occupants. Two additional solar collectors are used for radiant floor heating to reduce the heating load in the winter time. 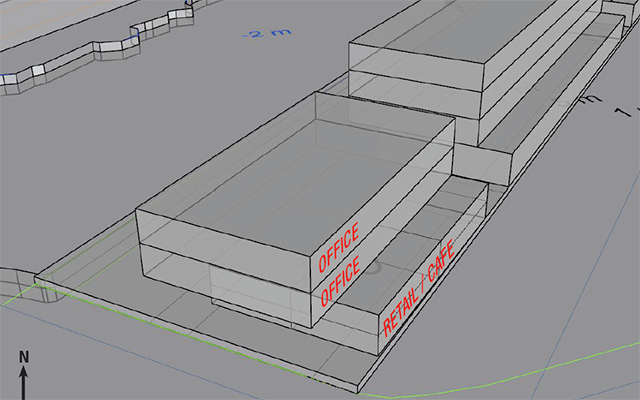 Plan for the first floor of the office space. We designed open floor configuration and placed mechanical rooms and bathrooms on the northeast side of the building, which are shadowed by the adjacent building. 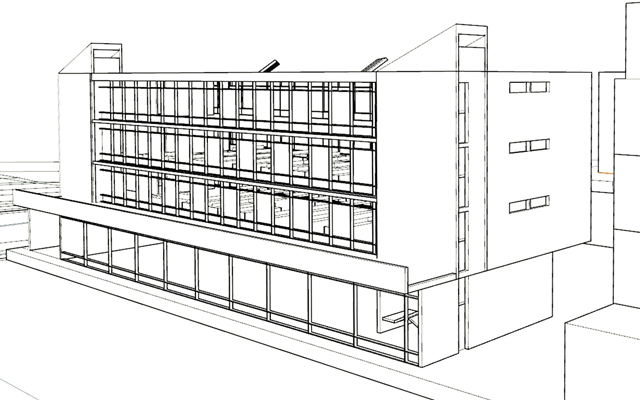 Section showing the natural ventilation concept with our operable windows.